In 1872, when Georges Bizet received the commission that would result in the composition of Carmen, there were two subsidized opera houses operating in Paris: the Opéra and the Opéra-Comique. Each theater staged works stemming from a specific operatic tradition and catering to a specific audience. The Opéra presented French grand opera and attracted the upper class; the Opéra-Comique drew members of the middle class and presented lighter works, loosely referred to as "opéras comiques." It was at the Opéra-Comique that the premiere of Bizet's Carmen took place, and this opera should be viewed as participating, albeit not always comfortably, within the parameters of the tradition of opéra comique. The term opéra comique originated in the 18th century and designated a stage work consisting of pre-existing tunes and spoken dialogue. During the course of its development, opéra comique drew on many influences, most prominently vaudeville and the comédie-ballets of Molière (that is, a combination of a comic play with ballets in between the acts). The latter in particular was famous for lampooning middle-class foibles while combining vocal music, dance and dialogue featuring witty repartee. The year 1752 saw the introduction of a third influence on opéras comiques when a touring Italian troupe brought the highly successful opera buffa La serva padrona by Pergolesi to Paris. This work led to a rather embittered dispute over the proper aesthetics of musical theater, and had a profound influence on French operatic composition. The French composers were not slavish imitators, however, and utilized spoken dialogue à la Molière and simpler strophic arias (the French word is "air") approximating popular song. One of the earliest French works demonstrating the influence of opera buffa was Le devin du village of 1752 composed by the famous philosopher Jean Jacques Rousseau. 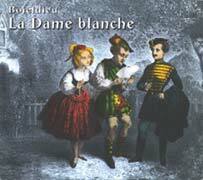 It was not until the early 19th century that the term was consistently used in its modern sense, that is, to denote a French opera with newly composed music and spoken dialogue. Nevertheless, it is important to note that most French composers, obsessed with the accurate labeling of their works, did not feel that the term was widely applicable. Thus opéra comique should not be considered a distinct genre but rather a procedure involving the juxtaposition of lyrical and spoken sections. In 1856 the composer Jacques Offenbach published an extensive guide to the tradition, which he considered distinctively French. As opposed to what Offenbach saw as the predictable plotlines of the Italian opera buffa, the composer claimed that opéra comique demonstrated the French love of wit and mischief as well as a greater variety of forms. However, at the very time that Offenbach was extolling the tradition's variability, the Opéra-Comique demanded works that were increasingly conservative to match the growing conservatism of their audiences. By the 1850s the opéra comique tradition had lost much of its satirical nature and was considered "family entertainment" with rather rigid conventions of its own. In general, opéras comiques avoided the overblown spectacle of French grand opera (which cultivated elaborate scenery, massive crowd scenes, and dramatic spectacle, and were heroic and tragic), favored choral writing to ballets, and employed lighter voices in the leading roles. Its plots were highly sentimental, unambiguously moral in character, and invariably ended happily. It should come as no surprise that Carmen with its degenerate characters, its unbridled sexuality and its onstage murder, struck its audiences as a shocking departure from the normative model of opéra comique. Indeed, that was partly the point. Camille Du Locle, one of the co-directors of the Opéra-Comique, had hoped that Bizet would revitalize the institution. Bizet had set his sights even higher, writing to Du Locle that he would "be delighted to try to change the genre of opéra comique." In the end, Bizet seems to have accomplished much more than that. While such wildly successful opéras comiques as François Boieldieu's La Dame blanche are now nearly forgotten and seldom performed, Bizet's Carmen has become a constant presence on the opera stages of the world and in the popular imagination for over a hundred years after its premiere. It seems to have nearly effaced the tradition it merely sought to expand.